According to the Centers for Disease Control and Prevention, nine people are killed each day in car accidents involving distracted drivers, and more than 1,000 suffer personal injuries. Distracted driving includes any activity that takes your attention away from the road. Learn how you can stay safe on the road and avoid being the cause of your own or someone else’s pain and suffering. Cell phones have permeated nearly every part of our lives, including our vehicles, and they can prove deadly to drivers, passengers and pedestrians. 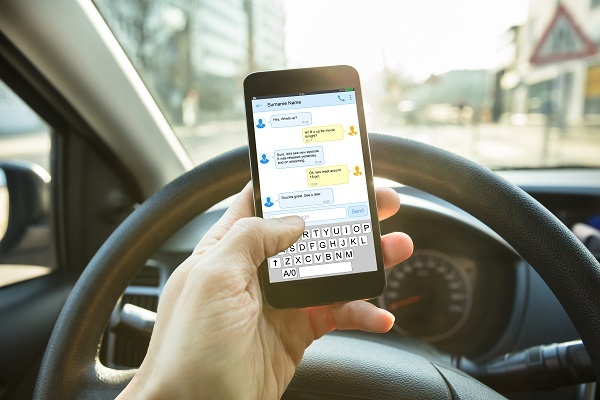 More than 1.5 million crashes per year are caused by cell phone use while driving, and one in four auto accidents are caused by texting and driving. Rather than simply silencing or putting away your phone when you drive, turn it off completely. If you can’t hear your phone buzzing as messages and calls come in, you’ll be much less likely to look at it. Even hands-free calling and voice-to-text software popular in vehicles today divert your attention from the road, so it’s best to rid yourself of the temptation altogether. Many smartphones now have a “do not disturb” setting that will automatically turn on when you’re driving. This feature blocks incoming texts and calls, and sends those trying to contact you a message that you’re behind the wheel. It even allows people to reach you during an emergency situation. When you’re traveling at highway speeds, your car moves half the length of a football field in two seconds. This means that taking your eyes off the road for even a split second could lead to a crash. If there is an emergency situation that demands your attention, pull over before tending to it. In a similar vein, you should pull over any time you need to multitask or perform another activity. If you feel drowsy, pull over and rest, or call someone to pick you up. Nothing is worth a life. You’re ultimately responsible for your actions behind the wheel, but enlisting the help of others in your car is never a bad idea. Ask your passengers to minimize talking and other distractions so you can focus on driving. You may even consider limiting the number of passengers in your vehicle at one time. Some states have graduated driver license laws that prohibit new teen drivers from having any passengers in the car. However, even experienced drivers should consider passenger limits. Talking with friends and family while driving can easily take your focus away from the road. Distracted driving kills. We can’t stress this enough. If you cause a car accident due to negligence and distracted driving, you will have to face the fallout. Don’t let this happen to you. Keep your eyes on the road, and pull over when you cannot. Each time you get behind the wheel, you have a responsibility to drive safely. Even the safest of drivers can still be hit. If you’ve been seriously injured in an auto accident involving a distracted driver, call 833-546-3675. The Kelleher Firm’s legal team can help you get the compensation you deserve. We serve clients throughout southwest Florida, including Fort Meyers, Naples and Cape Coral.